Although many people experience tooth loss, this condition does not need to be a permanent part of your life. In order to provide lasting replacements for missing teeth, Dr. Hugh Allen provides dental implants using the latest technology and individualized treatment planning. Allen Dental offers a variety of implant services in Pembroke Pines, and Miramar to help patients regain the function and beauty of a full smile. While the cosmetic effect may seem apparent, the long term impact of tooth loss goes beyond an incomplete smile. Over time, the gum and bone tissue around missing teeth is lost, which contributes to a host of aesthetic and oral health concerns: pre-mature aging, complications with eating and speaking, and difficulty keeping good hygiene. Dental implants are designed to completely replace teeth and offer benefits both to appearance and overall wellness. 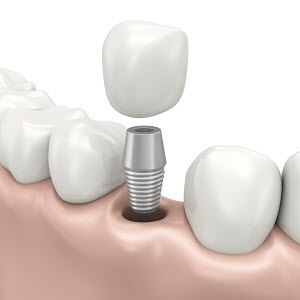 An implant is composed of three main components - the post, abutment, and restoration. These pieces work together to substitute both the visible surface of the tooth and the root, preserving facial structure and promoting renewed utility. If you are concerned about missing teeth affecting your wellbeing and are ready to discuss your options for treatment, schedule your consultation visit with Dr. Allen today. Our practice uses modern dental technology and guided surgical techniques to take the guesswork out of implant placement. With our cone beam CT scanner, we are able to obtain 3D images of both your teeth and jaw. This comprehensive view allows Dr. Allen to perform implant procedures with predictable outcomes. Single Implants – When individual teeth need replacement, a single implant can be used. Dr. Allen tops the implant with a crown to re-create the appearance and function of a natural tooth. Implant-Supported Bridges – Our dentist can recommend this option to fill spaces created by multiple missing teeth. Anchored by implants, these bridges provide a sturdy replacement without the need to alter healthy teeth. Overdentures – These appliances use implants as support, granting patients greater stability and a better fit compared with traditional dentures. Hybrid Dentures – Dr. Allen can provide these implant-retained prosthetics for patients who would benefit from a permanent solution. On a case-by-case basis, our dentist uses mini implants for this and other restorative options. All-on-4® - Through this innovative approach, only four strategically placed implants are needed to replace an entire arch of teeth. Along with stable oral and general health, ideal candidates require enough jaw bone density enough to securely hold their implants. Our dentist collaborates with trusted specialists in situations where a sinus lift or other procedure is necessary to build up the jaw bone and improve the success of implant placement. Dr. Allen may perform in office grafting to promote healthy gums by reducing the risk of recession or disease. Dr. Allen believes that successful treatment is more than performing a procedure; it is about providing care on your terms. For this reason, our dentist places implants on a timeline that suits both your dental health needs and your comfort level. Depending on your situation, Dr. Allen can perform immediate tooth extraction and placement. When appropriate, you can also receive multiple implants in a visit, reducing the number of visits needed to complete your smile.